Welcome to Picus Book Player Help. 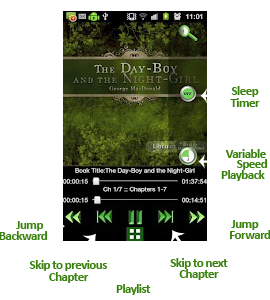 Picus Book Player is very useful to all android mobile users who want to listen audio books and compressed audio files which run on Android OS. Application consists of following screen windows. User can use this button to play or pause the currently playing book. User can navigate through chapters of the book using these buttons. User can move to next or previous chapter by clicking the dedicated button. By press and hold any of these buttons, chapter information window will pop up as shown in below figure. User can play any chapter by selecting chapter from this window. 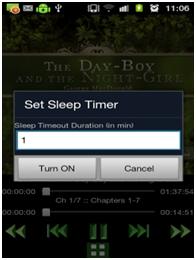 The main screen GUI of the book player contains the button for to jump +/- 10 min. using this button user skip the audio in from of 10 minutes and in multiple of 10 min. Jump time is configurable and user can selects the value from the preference menu. 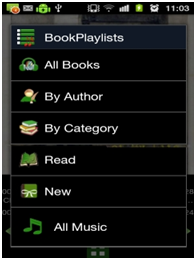 By clicking this button, Playlist window will pop up as shown in below figure. Multilevel playlists sorted by Author and by Category of books. Playlists can be sorted as in A-Z and Z-A order. Also New and Read playlists for quick access to latest Book files. User can set Sleep Timer using this button. By clicking this button, Sleep Timer window will pop up as shown in below figure. Suppose user selects the timer value to 15 minutes, after 15 minutes, book player will stop automatically. 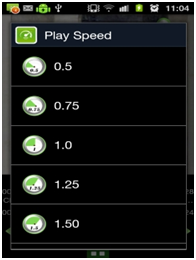 By clicking this button, Variable Speed Playback window will pop up as shown in below figure. User can change the speed of the currently playing speech or audio using this feature. User has to change the time scale value using time scale change bar and according to the changed time scale value speed of playback will be changed. Range of the time scale value is 0.5 to 2.0. Default value is set to 1.0. By long press on Cover Art, download cover art window will pop as shown in below figure. User can download cover art from Internet or from gallery or from book using this window. 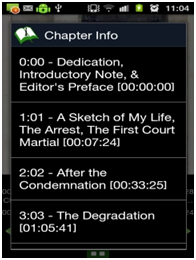 Picus Book player displays the cover art for each book and each chapter on the top of the screen. It displays the cover art from the book if available. If Book does not contain the cover art it gives user the options to set the cover Art from the media gallery or from internet.